I don't know why but I have that song in my head. If I've learned anything from all my projects, it is that almost nothing turns out exactly like I picture it in my head. Case in point? My office chair. My YELLOW office chair. That was supposed to be my ORANGE office chair, like this sweet vanity from Cassie's daughter's room. I knew it was time to redo this chair when I heard an awful CRACK! followed by a THUD! one night. I ran into the office (this was in NY) to find hubby lying on the floor next to the top half of my chair. After I wiped my tears of laughter and caught my breath, I saw the damage done to the chair. The metal had come unwelded from the bottom and when the top of the chair cracked off it had made a huge gash in the seat and on one of the legs. It used to be a pretty chair... originally purchased from Pier 1 about 8 years ago. Hubby insisted on throwing it away, but I threw it in the garage knowing it could be fixed. After we moved back to TN I had my Pa weld the top and bottom back together. Just like new! It was time for a new coat of paint though. So over Spring Break I finally got to it. At this point I was having serious doubts about whether the chair was worth all this trouble. But I kept on. There were a lot of nuts/bolts and screws for this chair, so I put them all in baggies with pictures so I would remember where to put them. After a few choice words I just kept on sanding. A few nights later I moved inside to paint the chair at the same time I was painting The Pink Lady. This is where the color issue became apparent. I had bought a sample size of the sweetest little orange. I noticed a lot of red around the rim of the container (you can kind of see it in the picture). I think what happened is the red did not make it into the sample like it should have, hence the yellow, rather than orange color. Oh well. It'll match my cheap-o painting. After the paint dried I moved it back out to the garage to glaze with my dark walnut Minwax and wipe on a coat of poly. Here she is in her new home. It may not be the sweet orange I wanted, but it is tons better than the old wood. oh, i love it, katie! so fresh and fun and so you! I think your chair looks great in yellow! It was worth it in the end! I think you did a great job! And I love the chalk board too! You always have a funny story, girl! the chair looks so sweet! I don't think I could have had the patience to fix it! You did a great job!! And like your chalkboard too! love the color!! what a great redo! I love the color you chose. So bright and cheerful. 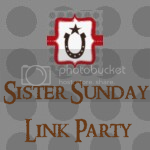 I would love for you to share it on More The Merrier Monday's Link Party!! Way to make lemonade out of lemons! I think the chair turned out great, and your persistence paid off. Great job. I love the new color. Looks awesome. Thanks for sharing at my Swing into Spring party. I just found your blog and am your newest follower. Thanks for creating such an amazing blog full of inspiration. I'll be back often (and I LOVE the chair and fab calender)! The yellow added so much. Much nicer than it started out! Visiting from Show and Tell at Blue Cricket. I think they yellow looks great! i HEART Yellow so so much and this chair did not disappoint. It is beautiful, fun, and happy. I think I need a yellow chair in my house. Come and say hello. Fabulous! I love the yellow! Fixing it was well worth the hassle, I'd say. It's CUTE! Good work! So funky & chic!! Thank you for linking to my K.I.S.S. blog bash this past week. I so appreciate you taking the time to share your great chair makeover. Tomorrow is another blog bash, please drop by & share more of your inspiring ideas! fabulous chair! I always think I'll remember where screws go (OR what they go to) but I rarely do. Well, I think she looks great! Cheerful and fun and now you two have made a memory together. LOL! Thanks so much for linking up to Inspiration Friday Katie! Love the new color of the chair. Well done in fixing it! Oh my goodness! So cute and I love the yellow! The chalkboard is so sweet too, cool idea to use it for a calendar:) I'm a new follower! Such a fun color! I've been really digging bright colors lately (must be a spring thing! )Thanks for linking up! Best. Office. Ever!!! I'm officially stalking your blog now.